Nothing says summer quite like the flavors of Neapolitan ice cream. 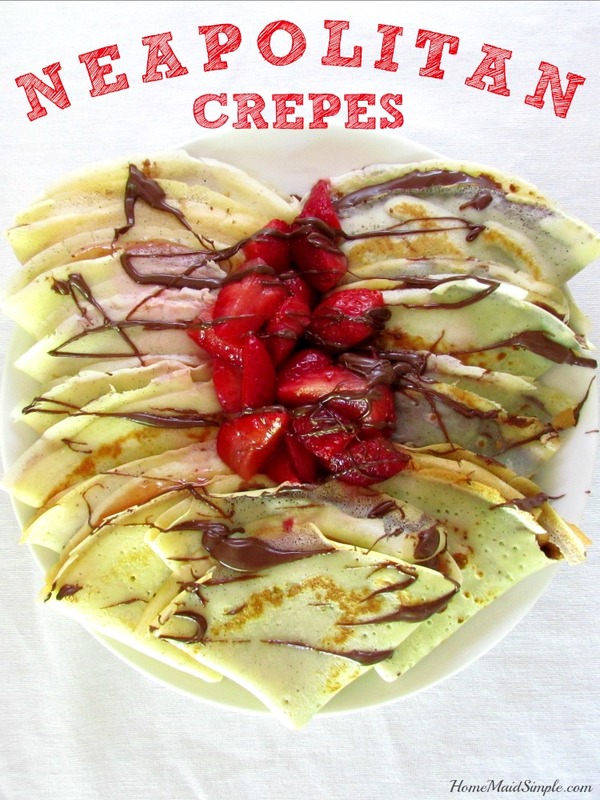 Except when you can get those flavors with fresh berries in other foods like these Neapolitan Crepes. I received product for review, all opinions expressed are my own. This post may contain affiliate links and I will receive compensation if you click on and purchase through them. I’m a big fan of crepes. I wasn’t as a child, but I like to believe my taste buds have refined the older I’ve gotten. Now if only I could get my kids on the same page. They’ll try anything once though, especially if it looks like chocolate and strawberries have been combined. This isn’t quite chocolate, however. No this is something better – this is Rigoni di Asiago’s Organic Hazelnut Spread with Cocoa and Milk. This is Nocciolata. 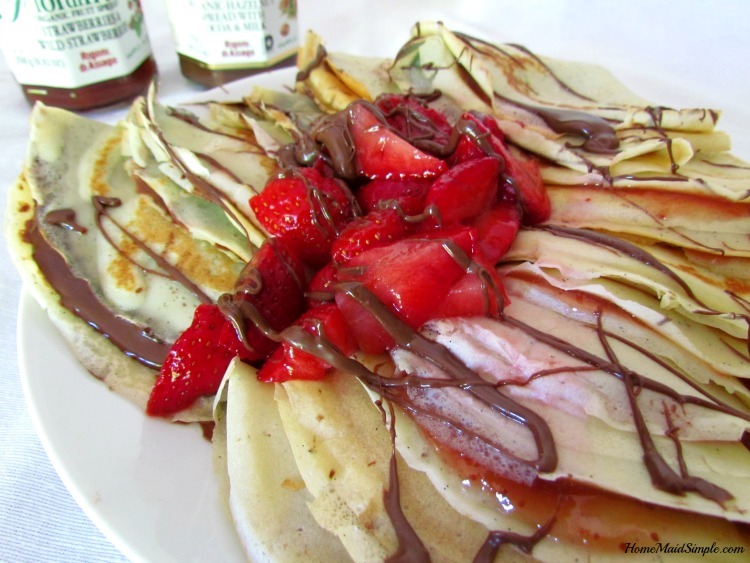 I took the liberty of spreading half a crepe with Nocciolata and the other half with Fiordifrutta – a strawberry fruit spread that tastes like the kind my Nana use to make. Now don’t you worry, I didn’t forget about the vanilla. It wouldn’t be Neapolitan Crepes with that very distinct flavor. A delicious vanilla bean was added to the actual crepe batter making these a treat that literally just melts in your mouth. My culinary creation was finally finished when I topped the crepe stack with fresh strawberries and drizzled on more of the Nocciolata. It just doesn’t get better than this if you’re looking for a sweet crepe any time of day. We had them for lunch – but breakfast, dinner, or dessert work just as well! Combine eggs, milk, flour, salt, and sugar in a blender. Scrape out the vanilla bean and add to the blender. Blend until well combined, and a smooth texture. Heat a small frying pan on medium heat. Pour 1/4 cup crepe mix into pan. Tilt pan until the bottom is covered in a thin layer of mixture. Cook 30 seconds, or until the edges easily come up. Flip and cook the other side 10-20 seconds. 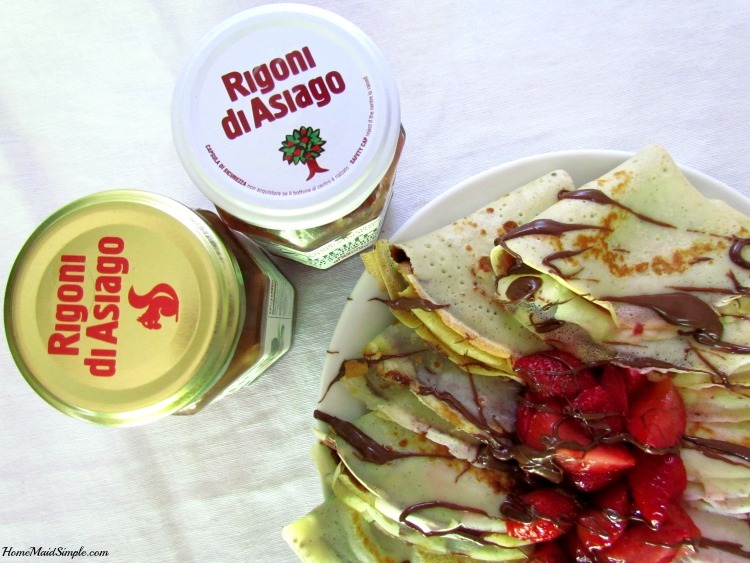 Spread with Rigoni di Asiago Hazelnut and Strawberry spreads. Serve warm with fresh strawberries and more Hazelnut drizzled across the top. The mixture can sit in the fridge for up to 24 hours, so you can make this for breakfast the night before! 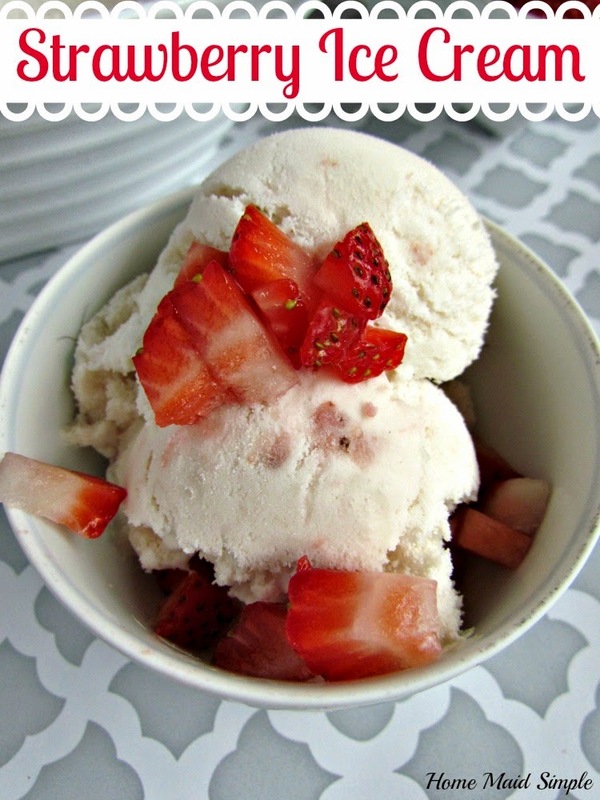 Take advantage of Strawberry Season and try this Strawberry Ice Cream Recipe.